Hiflux has extended its world class heat exchanger technology to provide liquid cooling modules for IGBTs, MOSFETs, and other components used in power electronics applications such as variable frequency drives, rectifiers and power supplies. Hiflux liquid-cooling units for power electronics consist of an array of pins laser-welded between two thin plates. The product is ultra-compact with low thermal resistance. Coolant passes between the plates and around the pins, removing heat effectively, while keeping pressure losses low. Many mounting and connection options are available – including dual-sided. 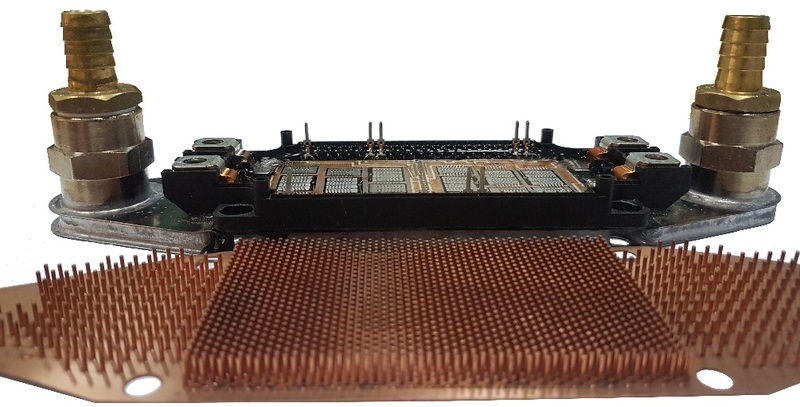 Hiflux can supply high-performance, all-copper, liquid-cooling modules to replace conventional cold-plates in demanding power electronics applications. Products can be tailored to customers’ specific thermal and footprint requirements. Many mounting and connection options are available. Hiflux technology was used to create an IGBT module with integrated heat sink as part of the Innovate UK funded consortium project ‘HiCo’. Hiflux can test custom units in-house to ensure that the expected performance is achieved before being put into service.